Castlevania, better known as Castlevania 64, (悪魔城ドラキュラ 黙示録, Akumajou Dorakula Mokushiroku?, lit. 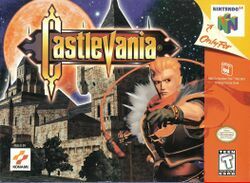 Devil Castle Dracula: Apocalypse) was the first of two Castlevania games for the Nintendo 64. It stars Reinhardt Schneider, heir to the Belmont family, and Carrie Fernandez (Belnades), a girl gifted with magic powers. It has been officially removed from the series canon. This page was last edited on 15 October 2018, at 08:38.